It should come as no surprise that The Power of Positive Thinking is a foundational book for fostering a positive mindset. Peale’s optimism of the power of the human spirit to overcome challenges and achieve success is evident throughout the book. While it’s debated whether the anecdotes in the book are fact or fable, it’s of no matter. The stories illustrate how the power of positive thinking is a key to achieving a state of happiness and success. And it certainly beats the alternative. I know of very few, if any people who have achieved a lasting state of happiness or success looking at life through a pessimistic lens. Because of his positive, infectious nature, it’s no surprise that many famous people, including several past presidents, had sought out his council. What he preached works. When I’ve made a conscious effort to commit and apply the teachings in his book, I see a difference in my mental outlook, which directly reflects in the results that I see in all aspects of my life – personal and professional. It also just results in an overall better feeling and state of being. Perhaps most importantly is that Peale’s teachings help control that “inner voice” that talks to us all day long. That inner voice controls and determines our mood, our actions, and our overall outlook on life. The more we can train and control our inner voice, the better our chance at achieving the outcomes we desire. I would be remiss if I didn’t address one aspect of the book that some people may be put-off by. Since Dr. Norman Vincent Peale was a pastor, the book contains many biblical and religious references. For those that are spiritual, the book will speak to your faith and deepen it. If you’re not spiritual, you need to get over it and read the book. You must understand that the primary message of The Bible, particularly the New Testament, is one of hope and faith. In fact, having faith creates hope. It’s the message that nearly all modern, secular self-help books are based upon. In other words, the messages you get from modern, secular books are not new. They have been around for hundreds of years, if not thousands. They’ve just been re-purposed and re-packaged for consumption by the modern world. It makes The Power of Positive Thinking worth reading so one understands where these messages originated from. 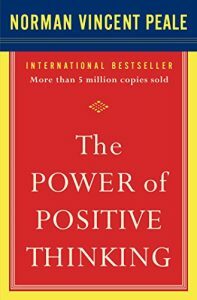 The Power of Positive Thinking is a Must Read and one that I would recommend to anyone who is training their mindset and inner voice. When incorporated with a regular regimen of mindset training reading and activities, it will have an impact on your life. It certainly has on mine.